In current practice, total hardness is defined as the sum of the concentration of calcium and magnesium ions, expressed as calcium carbonate. Hardness can be expressed as calcium carbonate in either parts per million (the same as milligrams per liter) or grains per gallon. Since automatic water softeners are rated in grains of hardness removal, the latter is more commonly used by U.S. consumers. One grain of hardness equals approximately 17.1 ppm of calcium carbonate hardness. There is no EPA Max. Contaminant Level set for water hardness, nor a specific limit at which water is considered especially or unacceptably hard. Natural waters may range from close to zero hardness to many hundred parts per million. In our experience, water hardness over 100 or 150 ppm (approximately 8 – 10 grains/gallon) is enough to warrant water softening. When water hardness exceeds 250 – 300 ppm, a water softener practically becomes a necessity, as piping systems, water heaters, fixtures, and appliances will otherwise become scaled up and worn out prematurely. At levels of 100 to 250 ppm (about 8 to 15 grains/ gallon) water softening offers mostly aesthetic improvements, reducing spotting of fixtures and surfaces, and making hair and skin softer. Our city water test kit and virtually all of our well water test kits include easy-to-use hardness tests that you can conduct on-site at home. If your water’s hardness is above the level you’d prefer, the best treatment method is to install a water softener. Water softeners use an ion-exchange resin that traps calcium and magnesium ions and replaces them with sodium ions. 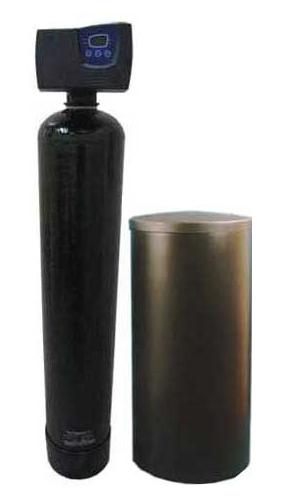 Water softeners are the most effective method of removing hardness in residential and commercial applications. There are many devices on the market that purport to eliminate the effects of water hardness by the use of electrical fields, magnetism, or catalytic metals. All these devices claim to reduce the effects of the hardness minerals and eliminate the effects of scale and build-up in piping and appliances such as water heaters. Many consumers, however, report little change after using these systems, and the claims of these manufacturers are not independently verified by recognized testing authorities such as the National Sanitation Foundation or Underwriters Laboratories. Instead of using water softeners and physically removing the calcium and magnesium minerals, some commercial applications use phosphate injectors. Polyphosphates and some ortho-phosphates sequester the hardness minerals and prevent scale formation on pipe walls and in water heaters. No water hardness is removed, but the piping and appliances are spared the effects of hard water. Similarly, salt-free conditioners convert hardness minerals to firm calcite crystals rather than removing them as a regular softener would. These crystals are unable to attach to piping or appliances, and thus cannot form scale deposits; they will also wear down pre-existing scale deposits as the conditioned water passes through plumbing and appliances. Browse our selection of test kits, softeners, and salt-free conditioners in our online store, and consult our resources page for more info on water hardness and other water problems.